Reicast Libretro and Reicast OIT Libretro have recently been updated. AMD GPU owners on Windows/Linux and Intel HD users on Linux/Mesa should probably be able to use the Reicast OIT core now, as several GLSL compliance bugs have been fixed by now. Note that Reicast OIT can still be very buggy for Intel HD users on Windows, and slow to boot. The renderer really lends itself better to discrete GPUs from AMD/NVidia. 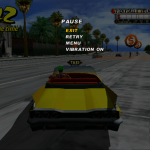 Previously, games which rendered to texture (such as Dead or Alive 2 or Crazy Taxi) would always output at 1 x native resolution. Now, you can set the upscaling factor. Games which render the screen to a texture should look much better as a result, provided your GPU is up to the task. Previous post:Reicast Libretro – Updates!